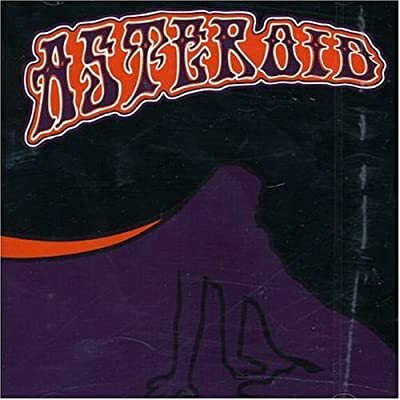 The Album Of The Day is the 2007 self-titled release by Swedish rockers Asteroid. Asteroid's eponymous debut full-length is a blazing example of first-class progressive songwriting wedded to deep fuzz, and it's a milestone in the maturity of heavy Swedish desert rock as it redefines itself, slowly waving good-bye to the ghost of Kyuss. Well after all, it's more than 10 years since the K-boys called it a day. While excellent American groups such as Hermano and Sasquatch keep the more straightforward brand of desert rawkin' burning - a purer strain, as it were - their Swedish brothers seem to be mining a more experimental vein of desert gold. There is ample precedent for this. The obvious example is QOTSA, but Sweden herself was not bereft of groups exploring that territory well before Y2K. I'm speaking, of course, of Mammoth Volume, which is slowly emerging as one of the most influential of Sweden's heavy underground bands in the last 10 years, on par even with the mighty Dozer, against whom seemingly all Swedish desert music is compared. MV had the smarts to put their considerable intelligence to work in interpreting the long European tradition of progressive rock, with all of it's dynamics and instrumental chops. They were bright enough not to listen to the pc musical opinion mafia, which always cries "pompous" and "pretentious" when the subject of europrog comes up. Hell, for all I know MV themselves may consider ELP as the very soul of pomposity, but they're also wise enough to know that the early 70s version of all of these bands produced much challenging and worthwhile music indeed. MV simply extracted some of that worth, combined it with groove and desert fuzz, and Voila! music that was bright and challenging enough to cause fan(atics) to jump on planes to cross the big pond, just to see 'em in concert. So how does Asteroid fit into all of this? Despite their name and songtitles such as "The Infinite Secrets of Planet Megladoon," this lp is not space rock. There are no 12+ minute peans to space by acid-gobbling visionaries here. It's a bit closer to modern practitioners such as Qualone or Valis, but really this superb disc makes the most sense as a progeny of Mammoth Volume, which is a very good thing indeed. Asteroid has constructed an excellent slab of somewhat eccentric underground heaviness here, replete with melody, harmony, and enough chewy fuzz and heavy bass/drum interplay to make any fan of progressive desert goodness faint with delight. The heavy prog fuzz of 'The Great Unknown' serves as a prime example, accented by atmospheric keys, fine dual vocals, and a subtle, controlled use of wah. 'Panoramic Telescope' with it's spacy lyrics giving a nod to the past, will mellow you out, while 'The 13th Witching Hour' provides interest with its slinky, quirky rhythm and deep fuzz. The album's capper is 'Dr. Smoke,' chock full of retro keys and harmonies. A cultured "hell yeah!" is in order.